Become a master of the "now what?" moment! As a leader, you know that complexity, responsibility, change, and uncertainty come with the job. How you manage uncertainty sends a big ripple through your organization. Learning how "to be" when the answer is unclear may be the most important leadership muscle you need to build. Leadership expert Brenda Reynolds equips you with information, strategies, and real-life examples that will grow your confidence and hone your leadership skills. 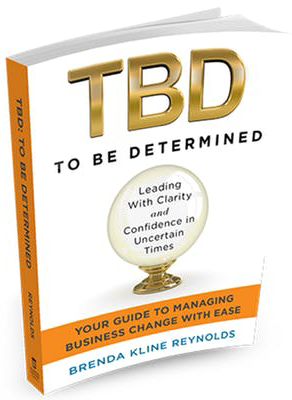 TBD will help you find power and clarity in the midst of any change. For more than 20 years as a respected organization consultant and thought leader, Brenda Reynolds has supported clients including McDonald's, Speical Olympics, Sherwin Williams, and the Nemours Pediatric Health System during times of transition. Through her consulting, coaching, training, and speaking, she equips individuals and organizations with easy-to-apply strategies for navigating change, developing leaders, and creating resilient cultures. Brenda is a TEDx and Vistage International speaker whose passion is helping others realize that within every "now what?" is a "why not?!" ready to be unleashed!